Water small spaces more efficiently with a new series of MP Rotators designed for distances from 6' (1.8 m) to 12' (3.6 m). The SR series offers the benefits of multi-stream multi-trajectory (MSMT) technology in areas smaller than ever before possible. The new MP800SR provides the same excellent wind-resistance, high distribution uniformity, double-pop nozzle protector, and extreme resilience to dirt and debris found in standard MP Rotators. Realize water savings for tight spaces. 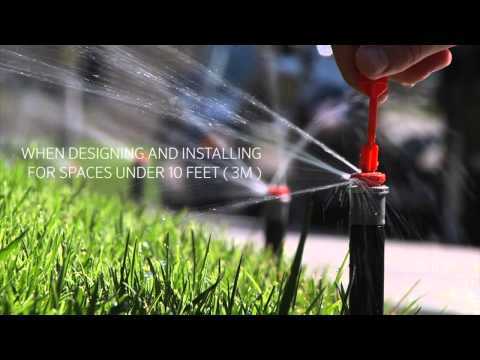 The MP800SR delivers water at a low application rate of 0.8 in/hr, less than half that of traditional spray nozzles. The MP800SR-90 and MP800SR-360 have a 0.8” per hour application rate and are not designed to operate on the same zones as other MP Rotator sprinklers. They do not have "matched precipitation".